At Impulse Chiropractic & Natural Therapies we strive to diagnose your injury, control your pain and facilitate a return to normal function as soon as is possible. Acute back pain that occurs suddenly can be the result of trauma. This can be the result of any combination of bending, heavy lifting or twisting in a way that causes damage to the muscles, ligaments or joints of the back. Unfortunately acute back pain can also develop without any apparent cause and be just as painful. Chronic back pain may also occur over a prolonged period of time as a result of repetitive motions (RSI) that put stress on the back. Impulse Chiropractic & Natural Therapies will determine the cause of your pain and put measures in place in an attempt to prevent recurrences. Disc bulge: Discs act like shock absorbers to reduce stress on your spine and are situated between your bony vertebrae. Disc injuries are common. 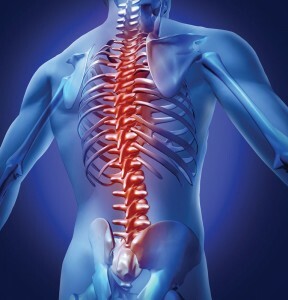 They can occur due to sudden movements or from long term postural stress, causing inflammation and pain, and in extreme cases can irritate nearby spinal nerves. This can cause radiating leg pain, pins and needles, and numbness (often mistakenly diagnosed as Sciatica). Impulse Chiropractic & Natural Therapies are continually educated in the treatment of Lumbar disc injuries.